Many businesses who have not used a coach before are confused about the differences and distinctions between business coaching and consulting. In a nutshell, a coach works with you to discover the issues in your business and suggests solutions and provides advice, but leaves the detailed implementation to the client. A consultant implements the solution for the business. Advantages of a Coach are that the owner is more likely to learn how to problem solve themselves by watching the coach at work and through implementing themselves, they become empowered with a good coach ultimately doing themselves out of a job! By undertaking the implementation themselves, the owner also saves a lot of money. This approach is also ideal for the owners of smaller businesses with turnover under $1 million. Advantages of a Consultant is that the implementation is done by someone else, and it is likely to be done more quickly. Obviously there is a higher cost for this, and the consultants knowledge leaves when they do. However, there are clear advantages of a turnkey solution, and at certain times it’s the right answer, particularly if it is a one-off situation or a skill which is only needed occasionally. It’s also an ideal solution for larger, more established businesses where the timeliness of the implementation of changes is important. 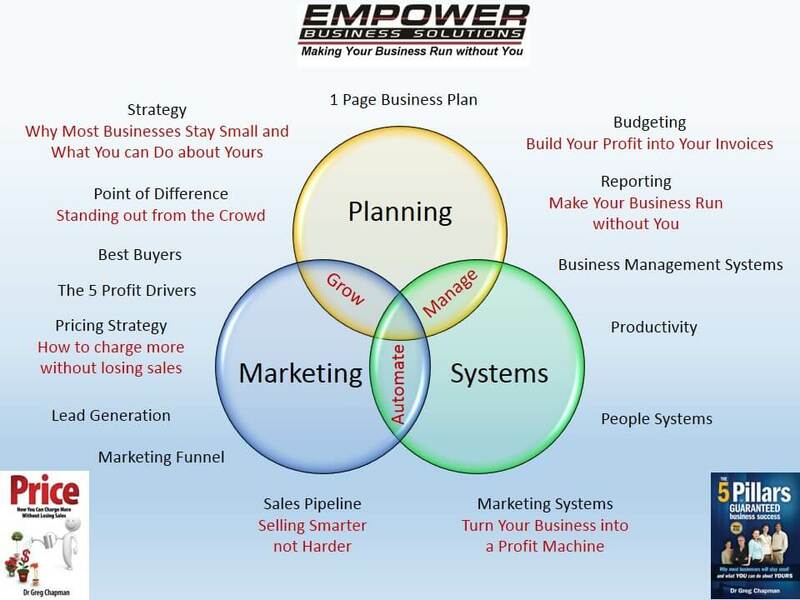 Empower Business Solutions Consultancy solutions are provided in more detail here. Have You been in business a number of years and are unsure about Your next step? Do you know where You want to take Your Business but unsure how to get there? Are you ready for the next step, but lack the confidence to take it on Your own? Define your ultimate business objectives including reality checked financials. Give you the knowledge so you will be confident of your success. Provide you with support as you implement your plan. Hold you accountable to delivering on each step in your plan. Find out how to apply these strategies to your business…. Certainly there is a cost of coaching, but that cost should be considered an investment. What value to your business would there be to achieve your 5 year goals in two? Natural ability alone will not guarantee success. Every Olympic champion has talent …. and they all have a coach. Every successful business person also seeks advice in some form. It could be from books, a course, or from a mentor or coach. Where do you seek your advice? Each of these alternatives has a cost, either in dollars or time or both. The alternative is the school of hard knocks, which charges the very highest fees. Then there is the opportunity cost; that is the cost of missed opportunities. Education and advice enables you to quickly determine which are the right opportunities for your business, and which ones should be avoided at all cost. The Five Pillars of Business Success: planning, marketing, systems, motivation and discipline are expertly covered in this book, giving you an insight into each. While there is no ‘secret formula’ to business success, there are steps you must take. The Five Pillars are these steps. Learn what successful business owners already know when you follow Dr Greg Chapman’s advice. Empower Business Solutions Coaching programs are designed to show business owners how to implement the Five Pillars into their business with customised, structured advice that produces the results business owners seek. A large part of what we do, is education. We will give advice. We will show you how to implement the steps. And we will provide you support when you need it along the way. Have the confidence to make the changes to take your business to the next level. And if there are road bumps along the way (and there will be- if it was easy, you would already have achieved your goals), we provide you with on call support. Our approach is very practical and covers all aspects of running a business- from Marketing Strategy to Business Management Systems. Our knowledge & experience enables us to tailor our programs to the needs of Your Business.